The Surface and Atmosphere Geochemical Explorer, or SAGE, mission to Venus would release a probe to descend through the planet's atmosphere. During descent, instruments would conduct extensive measurements of the atmosphere's composition and obtain meteorological data. 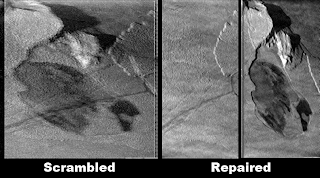 The probe then would land on the surface of Venus, where its abrading tool would expose both a weathered and a pristine surface area to measure its composition and mineralogy. Scientists hope to understand the origin of Venus and why it is so different from Earth. Larry Esposito of the University of Colorado in Boulder, is the principal investigator. The Origins Spectral Interpretation Resource Identification Security Regolith Explorer spacecraft, called Osiris-Rex, would rendezvous and orbit a primitive asteroid. After extensive measurements, instruments would collect more than two ounces of material from the asteriod's surface for return to Earth. The returned samples would help scientists better understand and answer long-held questions about the formation of our solar system and the origin of complex molecules necessary for life. Michael Drake, of the University of Arizona in Tucson, is the principal investigator. As a result of the restriction of using solar panels for this round of missions, each of these candidate missions will be sent to targets in the inner solar system or the asteroid belt. While outer solar system missions with short primary missions are possible with a combination of solar panels and batteries (as has been suggested for potential Enceladus sampling missions or Saturn atmospheric probes), none were selected for this round's New Frontiers mission. Io was a possible target for this round, but the solar panel restriction made an orbiter or a flyby spacecraft unlikely, and I don't think any were seriously proposed this time around. The next New Frontiers mission after this one is currently expected to allow the use of radio-isotope power sources. Out of these three potential missions, I would really like to see the SAGE mission approved. No spacecraft has landed on Venus since before I was born (I am excluding the VEGA balloons here since they were primarily atmospheric probes). And the descent imaging could be some of the most dramatic images that we could expect for the next decade. Check out Van Kane's post on this subject for more information. EDIT: As Ted points out in the comments, the VEGA probes did land on the surface, but they didn't return images of the surface, so they still don't count. I am still looking forward to the descent images from SAGE. I am going to try to writeup that Io Chemistry post up tonight or tomorrow morning, but in the meantime, here are a few quick notes. First, the Carnival of Space #128 is now up at the AART Scope Blog. Check it out to see what has been going on in the world of astronomy and space science this past week. Second, ugordan over at Unmannedspaceflight.com has posted a few newly processed images from the Cassini flyby of Jupiter. Some nice false color of the Pele and Tvashtar plumes. Welcome to the 126th Edition of the Carnival of Space! Each week, the Carnival of Space is hosted by different blogs and provides links to the best in the space and astronomy blogosphere so everyone can be kept up-to-date. We are this week's hosts! For earlier editions of the CoS, or if you want to learn how you too can participate in the Carnival, check out the Carnival of Space archive at the Universe Today. Now, since I learned I would host the Carnival of Space, I wracked my brain on how I would organize the links. Would I go the traditional route, outward from the sun? Would I go from smallest celestial body to largest, or vice versa? This week's carnival is the first Carnival to be hosted on Jupiter's innermost large satellite, Io, and in honor of that fact, I thought it would be a nice change of pace to go in order of least "active" to most "active", in terms of the amount of internal energy escapes that body. We will start first at the Moon. In recent years, various space agencies around the world have been racing to send unmanned probes to our nearest celestial neighbor. 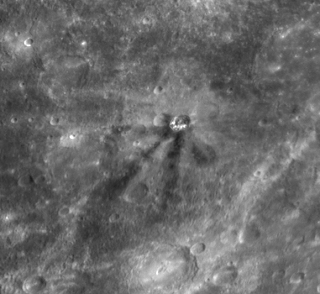 In NASA's most recent entry, the LCROSS satellite and its Centaur booster impacted within a permanently shadowed area near the Moon's south pole on October 9 in search of water. Phil Plait at Bad Astronomy took a look a look at the mission's "impact" on his fellow Earthlings versus the spacecraft's actual impact on the Moon. 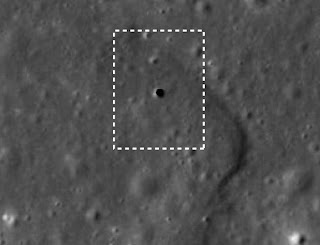 The discovery of a lava tube skylight by Japan's Kaguya spacecraft inspired blog posts by Emily Lakdawalla at the Planetary Society Blog, focusing on Kaguya's results, and by Ian O'Neill at Astro Engine, who took a look at the discovery's impact on possible human settlement of the Moon. For a bit of a historical perspective on the future of manned exploration of the Moon, Louise Riofrio at A Babe in the Universe took a look at Apollo moon samples and reflected on the Apollo missions' impact on life here on Earth. Finally, Hui Chieh at My Dark Sky showed off some great images of a crescent moon as imaged from Pulau Tioman, Malaysia. The next most active place we shall visit is Mars. The Mars Exploration Rovers continue to chug along at Gusev and Meridiani Planum. Well, Opportunity is anyway. That rover continues to make its way toward the crater Endeavour, checking out meteorites along the way. Stuart Atkinson at Road To Endeavour brings his poetic license to the latest of these, Mackinac. At Beyond Apollo, David Portree showed off pictures of models of a canceled pre-Viking, Mars lander, the Automatic Biological Laboratory, currently at the New Mexico Museum of Natural History and Science. From Mars, we move back toward the Sun to our own planet, Earth. More specifically, let's take a look at what folks were talking about regarding the exploration of space by sentient primates from that volcanically active world. The big news of the week was the release of the final report from the Augustine Commission, a committee that took a look at the current state of the United States' manned spaceflight program, where it should be directed over the next two decades, and how NASA's budget should be adjusted to meet those goals. Nancy Atkinson at Universe Today and Steinn Sigurdsson at Dynamics of Cats both provide an overview and their opinions regarding this report. Chuck Black at Commercial Space compares the chairman of the commission, Norm Augustine, to Liber Augustin and Augustine's 1990 assessment of the US manned spaceflight program. One issue highlighted in the Augustine report is the need for NASA to work with private spaceflight endeavors. Alan Boyle at MSNBC's Cosmic Log provides two reports from the ISPCS conference in New Mexico. These posts examine the need for the public and private spaceflight programs to work together and low-cost commercial spaceflight. 21st Century Waves has an interview with Stephen Ashworth and examines whether the optimism in spaceflight seen in the Apollo era might be making a comeback. Looking further into the future of human spaceflight, Weird Warp talks about the potential of moonbases and their requirements. At The Next Big Future, Brian Wang notes the upcoming Space Elevator Games beaming competition and has a cool trailer. Triggered by a 1997 article by Freeman Dyson, Music of the Spheres discusses the prospects and the possible timing for our expansion into the Greater Solar System. Looking at spaceflight today, Robert Pearlman at collectSPACE talks about a scarf owned by Amelia Earhart that will taken up into space on the Shuttle Atlantis next month by her photographer's grandson. 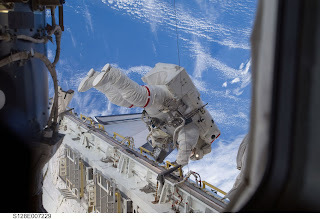 Cheap Astronomy presents their IYA 365 Days of Astronomy podcast covering the TDRS system, a group of satellites used to communicate with International Space Station and the Space Shuttle, for example. Looking at Earth, beyond just the exploration of its nearby space by humans, Robert Simpson at Orbiting Frog discusses fun ways to destroy our home planet. I like death by Heisenberg Uncertainty Principle myself. Another potential way to destroy our planet may be balloon boy hoax stories in the media, which Ray Villard at Cosmic Ray examines with an eye towards the media's interest in pseudoscience. 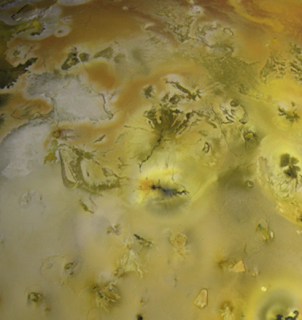 From Earth, we go to the most volcanically active moon in the Solar System, Jupiter's moon Io. From this blog, I summarized a paper presenting a new geologic map of the volcano Prometheus, the site of a persistently active volcanic plume. Finally, we move beyond the Earth and move out into the wider, more energetic universe, in this case looking at astronomy here on Earth. Robert Simpson suggests checking out the Astronomy Stars project, a South African site with tips and advice on how to communicate astronomy to the public and the media. For those with a space blog or are considering starting one, this site is a great resource. Alice's Astro Info has a video providing tips for buying your first telescope (you may not like her first answer...). Steve's Astro Corner has a post about the Cincinnati Observatory on Mt. Adams, what he calls the birthplace of American astronomy. The Chandra Blog, which focuses the results and observations of Chandra X-Ray Space Observatory, takes a look at a new visualization of the Chandra Source Catalog, a collection of information of all of Chandra's observations imported into Google Sky. I hope you all enjoyed this tour of this week's best of the space blogosphere. Hope you all have a great week! The abstracts for this year's AGU Fall Meeting have been posted online (you will need to go to the AGU meeting home page and click the "Fall Meeting Program and Itinerary Planner" link to get to the abstract page). The American Geophysical Union has two main meetings each year in the spring and fall. This year's fall meeting is in San Francisco, California (as it is every year) and takes place between December 14 and 18. Most of the Io-related talks and posters are in the oral and poster sections of the "The Galilean Satellites: 400 Years of Discover" session. In the oral session, which takes place on Friday, December 18, there are four invited talks that provide an overview of our knowledge of the geology and geophysics of each of the four Galilean satellites. The Io talk will be up first and will be given by Alfred McEwen (P53B-01). Melissa McGrath will discuss the atmospheres and aurorae seen at Io, Europa, and Ganymede in her talk, "Galilean Satellite Atmospheres and Aurora" (P53B-05). In the poster session, L. Roth et al. will present atmospheric modeling in their talk, "Modelling Io’s auroral emission and the interaction of the moon’s atmosphere-ionosphere with the Jovian magnetosphere." For this abstract the authors compared their modeled Ionian atmosphere and aurorae, based on data from the Galileo I31 and I32 flybys of Io, to ultraviolet and visible light imaging by the Hubble Space Telescope and New Horizons in 2007. Paul Schenk will take a look at Galilean satellite maps and how our knowledge of their surfaces have changed in recent years in his poster, "Galilean Satellite Cartography at 400 Years: A Long Way There, A Long Way to Go." David Williams will present a poster during the "Recent Results in Planetary Science and Their Impact on Future Science and Mission Priorities" session on Thursday evening covering the Io Decadal Survey white paper. Galileo made five successful flybys of Io during which it collected field and particle data from the satellite’s vicinity. We have reanalyzed the magnetic field data obtained from these flybys to assess the contributions of permanent and induced magnetic fields in the observations. We performed 3-D MHD simulations of the interaction of Io with Jupiter’s magnetosphere to determine magnetic perturbations caused by the satellite/plasma interactions. Our reanalysis of the difference data (observations – MHD perturbations) shows that a strong electromagnetic induction signature is present in the magnetic field observations. We have modeled the difference data using a three-layer model of Io consisting of a perfectly conducting core, a finite conductivity mantle and a non-conducting crust. The modeling results show that a global subsurface conductor is required at depths below 50 km to explain the magnetic field observations. We further show that a conducting core cannot produce the signature observed and that the response requires a conducting layer much closer to the surface. The high conductivity required of the subsurface conductor can only be explained by hypothesizing the presence of a subsurface magma ocean in Io. Finally, we place upper limits on the strengths of the dipolar and quadrupolar harmonics of the permanent internal field. EDIT 10/24/2009 12:33 PM: Had to edit links to the Abstract website since they don't seem to actually work... Try the AGU Fall Meeting home page, then click the "Fall Meeting Program and Itinerary Planner" link. A new, Io-related paper was published in the October 30 issue Journal of Volcanology and Geothermal Research titled, "Volcanic history, geologic analysis and map of the Prometheus Patera region on Io. The authors of this paper are Giovanni Leone, Ashley Davies, Lionel Wilson, David Williams, Laszlo Keszthelyi, Windy Jaeger, and Elizabeth Turtle. In this paper, the authors present a geologic map of the Prometheus lava flow field and surrounding terrain based on the Galileo's Solid State Imager (SSI) mosaic shown at right. The authors then combined this map with analysis of high-resolution data from Galileo's Near-infrared Mapping Spectrometer (NIMS) to determine the relationship between the albedo, topographic, and thermal features observed in SSI and NIMS data and geologic features at Prometheus. From this analysis, the authors can then infer the sub-surface structure beneath Prometheus. On this blog we have covered other recent geologic maps developed from Galileo regional-scale mosaics of Io, including the area near Zal Patera and Hi'iaka and Shamshu Paterae, as well as a few posts covering the global geologic map currently in production. 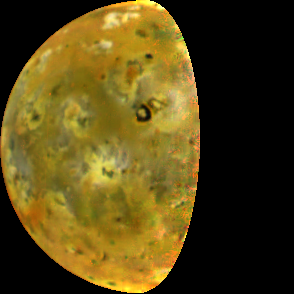 In Leone et al., the authors developed a map based on a two-frame green filter mosaic with a resolution of 150 meters per pixel from the Galileo I27 flyby of Io. The color version of this mosaic is shown above. Using mapping techniques developed over the last seven years with other Io mosaics, they observed eight material units in the Prometheus region: bright, white, and red diffuse material; layered bright plains material (concentrated in this region mostly in Prometheus Mensa, a comma-shaped, 250-meter tall ridged plateau bordering the Prometheus flow field to the east); white bright plains material; dark and undivided flow material; and dark Patera-floor material. Many of these materials relate to volcanic processes at Prometheus, such as the diffuse plume deposits and dark volcanic flows. One of the key goals of this mapping project was to determine the relationship between the observed material units and the volcanic activity at Prometheus. To help with this analysis, the authors took a look at high-resolution NIMS data from I24, which revealed several hotspots along the Prometheus flow field. In their paper, the authors compared this data with the same I27 regional scale mosaic they used for their map, however I've gone ahead and combined that NIMS and SSI data with the SSI mosaic acquired at the same time as the NIMS data and put them together into the animated gif at right. This animation allows for a better correlation between hotspots and dark flow units than the authors were able to find since they used SSI visible wavelength data that was acquired four months after the NIMS near-infrared data. The authors determined that the source vent for the Prometheus flow field, rather than being located at Prometheus Patera, a volcanic depression located at the northwest end of the flow field, or along part of the western bounding scarp/fault of Prometheus Mensa, is instead located at a small lava lake estimated to be 60 meters wide at the hotspot labeled 1 in the animated gif above. Lava erupts at this vent, along with a small, sulfur-rich plume, and flows south and west via insulated lava tubes. Lava then breaks out from these lava tubes at several locations along the flow field. In the NIMS data, you can see these breakouts as small hotspots, while in SSI data they are visible as dark flow areas. Many of the breakouts are located at the western end of the flow field, akin to bird-foot delta structures in terrestrial river systems. Lava from these breakouts covers up older dark flows which had been covered by a dusting of sulfur dioxide frost. This frost-lava interaction is what fuels the nearly persistent volcanic plume. Based on this scenario, Leone et al. was able to infer a possible sub-surface structure beneath Prometheus. 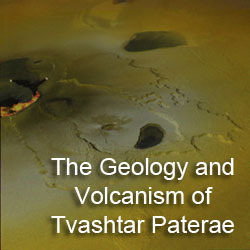 Based on the persistent yet episodically variable thermal emission at Prometheus, they suggest the existence of two magma chambers beneath Prometheus Patera, one located 30 kilometers below the surface near the boundary between the lithosphere and the asthenosphere, and a shallow magma chamber at a depth of 9-10 kilometers (with a roof at around 2-3 kilometers). Magma ascends from the mantle to the primary reservoir via excess local pressure and the ascent of magmatic dikes. From their magma travels to the shallow reservoir via a dike that uses a local thrust fault part of the way. This thrust fault, which bounds the western edge of Prometheus Mensa, when active, would locally relieve the global compressive stresses felt in the lithosphere as the result of subsidence, helping magma ascend to the shallow reservoir. Now based on the previous picture of volcanism at Prometheus, magma would then continue to ascend to the surface using that thrust fault. However, with the source vent now thought to several kilometers to the west of the surface scarp, it is now thought that magma rises from the shallow reservoir via a side conduit that runs up southwest from that chamber. Leone et al. 2009 presents a clearer picture of the volcanic history and eruption styles at Prometheus. 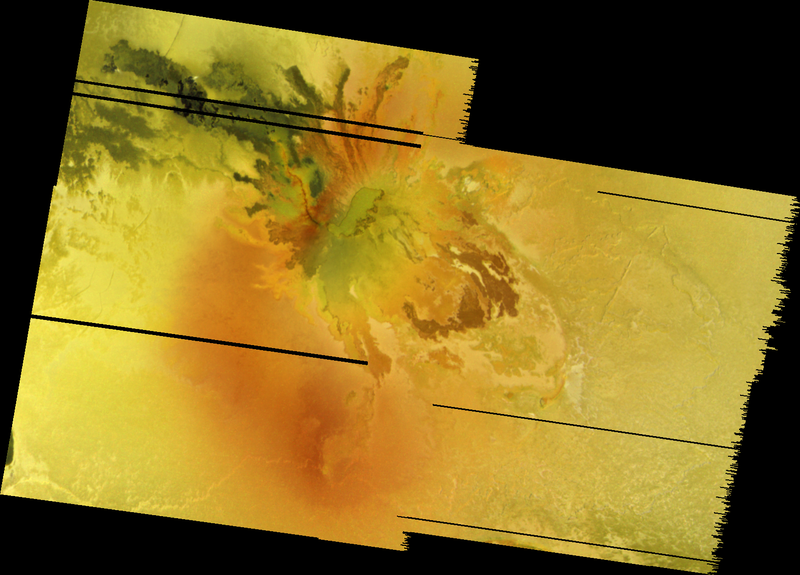 The authors combined a regional-scale SSI mosaic of the lava flow field (though strangely didn't deal significantly with the higher resolution data by SSI) and high resolution NIMS data to produce a geologic map of the Prometheus region. This allowed them to generate a plausible scenario for the formation of this flow field (and the north-south trending flow field seen by Voyager in 1979) as well as the sub-surface structure beneath the volcano. The blog Orbiting Frog has this week's edition of the Carnival of Space, the 125th edition. The Carnival of Space provides a summary of the week that was in the space and astronomy blogosphere. So it is definitely worth checking out to get yourself up to speed. Orbiting Frog, certainly one of the better blog names I've seen. Looking elsewhere, there are a few interesting blog posts to point out. Dr. Paul Schenk has shared some new 3D movies and images based on his model of the Callanish impact basin on Europa at his Stereo Moons blog. Callanish is a multi-ring impact basin, kind of a miniature version of the Valhalla basin seen on Callisto. The much smaller size, yet similar morphology, is the result of the thinner ice shell at Europa compared to Callisto's. The impact of the 3-5 kilometer wide comet or asteroid likely did not penetrate through to the liquid layer, but the ductile bottom layer of the ice shell disrupted the formation of the crater, leaving a series of concentric rings surrounding a relatively low and hummocky center rather than a central peak impact basin. A similar process occurred at Tyre elsewhere on Europa. Elsewhere, Ted Stryk processed an old opnav from Galileo showing Ganymede and Io, and gave it some color. Today, we finish up our look back at Galileo's I24 flyby of Io that occurred 10 years ago last Sunday. I had hoped to get this done a few days ago but present day encounters of Titan and Tethys had taken priority. While last week's Cassini encounters felt almost routine, though you can never presume that just because you've seen an area many times before that you won't learn something new, the flyby we've been looking back at here in this blog was definitely not so. In our last installment, we saw how Galileo's engineers and scientists had to overcome the spacecraft going into safing hours before the flyby was to occur, scrambled images, and a stuck spectrometer grating to pull off a fairly successful flyby. In this final installment, we take a look at some of the data that was returned by Galileo and what it taught us about Io. To put this data in a kind of video timeline, I created a Youtube video using Celestia and put together in Adobe Premiere Pro that I posted last week. Check it out if you haven't done so already. Despite the degradation of the majority of images acquired by Galileo during orbit I24, many of these images were still usable following a reconstruction effort at JPL using an alorithm in National Instrument's LabVIEW software. For example, cooled lava flows, pits, and channels are visible in this 13-frame mosaic covering portions of the Pillan lava flow. The eruption that formed much of the terrain visible here occurred two years earlier in a massive event that produced not only a 3100 sq. km lava flow, but also a huge pyroclastic eruption. Lava from the eruption would then cascade over the edge of Pillan Patera (to the southwest of the area seen in the mosaic) to cover the floor of that depression with dark basaltic lava. The rough texture, pits, and channels seen across portions of the flow field suggest potentially turbulent flow of Pillan's lavas, as well as a strong interaction been the emplaced lavas and the SO2 frost that coated the ground prior to the lava flowing over the surface. Observations at other flow fields, such as the mosaic covering Prometheus shown above, revealed a different story. Rather than a rough textured surface, SSI images revealed a patchwork of bright, sulfur dioxide frost, fresh dark flows, and older flows. The irregular margins of this flow field and the similar Zamama and Amirani fields suggested much thinner flow lobes (~1 meter versus 8-10 meters) than what was seen at the more rapidly emplaced Pillan flows. These flow fields, Amirani, Prometheus, and Zamama, are interpreted to compound flood basalt flow fields. Rather than being formed in one giant eruption, lava at these volcanoes is emplaced in the form of "small" breakouts on top of previously erupted lava. When lava from a breakout interacts with sulfur dioxide frost on top of the older lava, the sulfur is heated up and blasts its way through the meter-thick flow lobe, helping to form part of the plumes at these volcanoes. 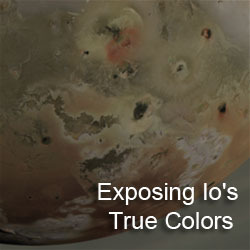 Several of SSI's observations were dedicated to the other major landform type on Io, its many tall mountains. This includes the high resolution mosaic of Ot Mons, an older mountain in the middle of Colchis Regio. 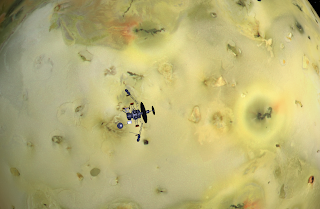 This mosaic and other lower resolution observations of Io's mountains closer to the terminator to the east revealed that nearly all of these structures are at some stage of degradation. This is despite the fact that these mountains are all less than one million years old due to Io's high resurfacing rate. The mosaic of Ot Mons revealed a structure covered in 100-meter tall, rounded hills with a mix of bright and dark material, with the dark material located mainly in topographic lows. The lower resolution mosaics of mountains such as Skythia Mons, Gish Bar Mons, and Monan Mons, revealed evidence for large landslides and significant faulting across the top of these mountains. In addition to evidence for various stages of degradation, evidence for layering was observed at several mountains, including one west of Donar Fluctus (seen near the center of the ZAMAMA02 mosaic). 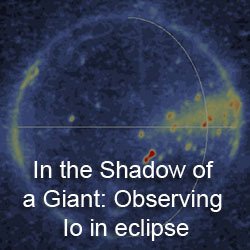 These SSI observations provided further evidence that Io's mountains generally consisted of tilted crustal blocks. The observed layering would then be old lava flows, pryoclastic material, and sulfur and sulfur dioxide ices that form layers in Io's upper crust. 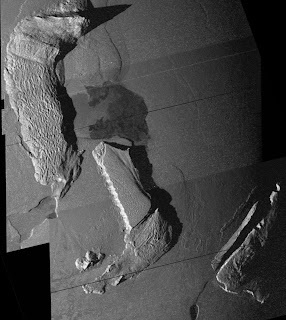 The observed degradation shows that these mountains begin to fall apart soon after they form as a result of sulfur dioxide sapping from those ice layers within the mountains and Io-quakes that must be fairly common. While NIMS, Galileo's Near-Infrared Spectrometer, was in ride-along mode for most of its observations and it lost much of its spectral resolution due to the stuck grating, it was able to make a number of exciting observations. 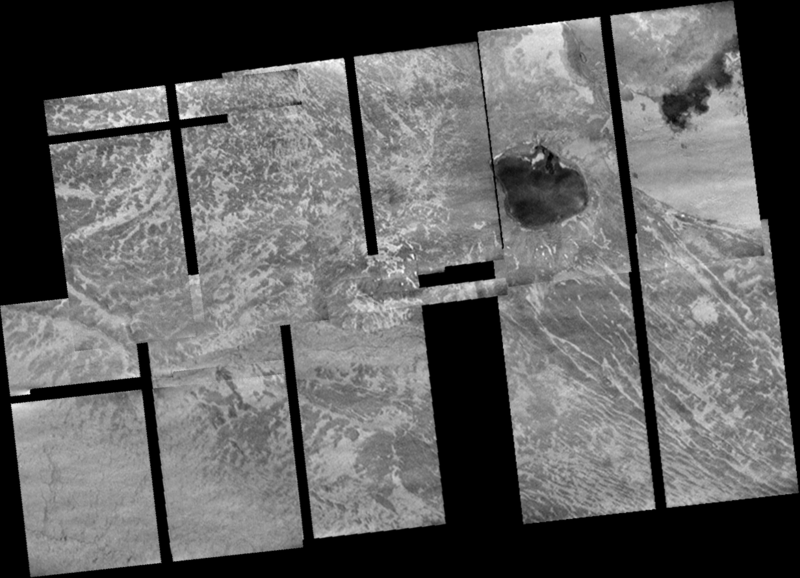 One of its first observations of the flyby covered portions of Loki Patera (shown at right) while the volcano was on Io's nightside. 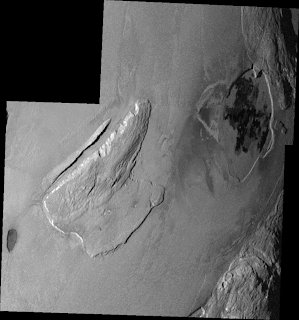 This observation revealed warm material within fissures in the bright island on the patera floor as well as within the darker, lava lake surface to the east. This data revealed dark material with color temperatures ranging from 305 K on the patera floor to 350 K in the island cracks. The NIMS team determined that assuming a starting temperature of 1475 K, the temperatures correspond to surface ages of about 127 days and 39 days, respectively, suggesting that the patera floor dates back to a prior Loki eruption, while the lava in the island cracks may date from the early stages of a Loki eruption at that started in September 1999. The uniformity of the surface temperature of the caldera floor along with PPR data taken a few minutes earlier has been used as evidence that the dark patera floor of Loki consists of one large lava lake that overturns episodically. 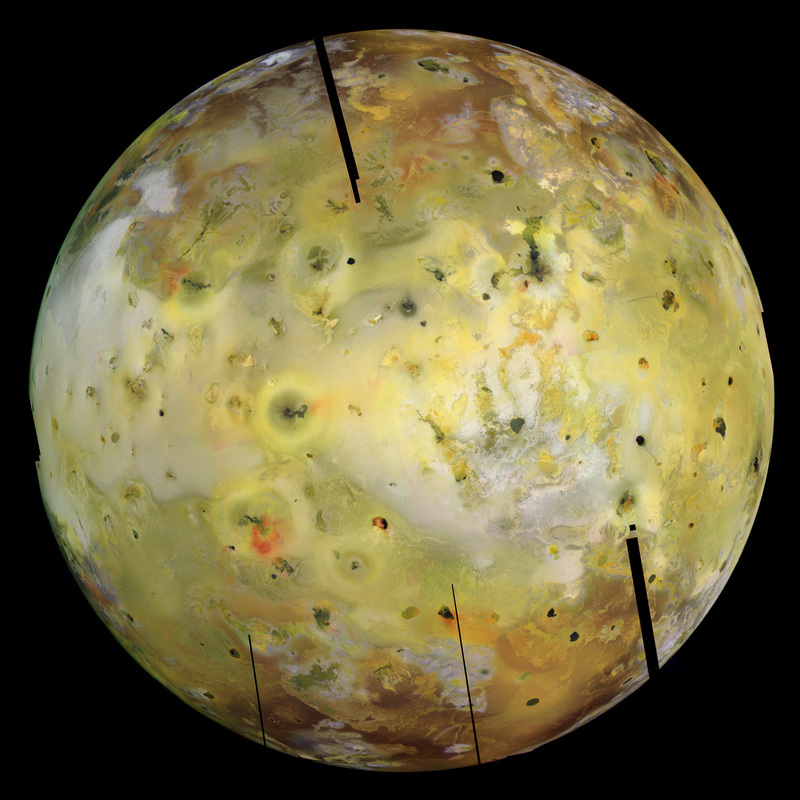 As Galileo passed Io, it was able to turn its cameras toward Io's dayside. This allowed NIMS to examine the distribution of sulfur dioxide frost across Io's anti-Jupiter hemisphere as well as search for hotspots and examine the fine scale thermal features at several Ionian volcanoes, including Prometheus and Amirani. For example, the image at right shows the region surrounding the volcano Prometheus. In this data from the REGION01 observation, two hotspots are seen at Prometheus, one associated with the vent in the east and the current breakout region to the west. Based on this and higher resolution observation, as well as co-analysis with SSI data, it has been suggested that lava at Prometheus erupts along a fissure that bounds the eastern end of the flow field. This lava then travels west via covered lava tubes until they reach a local topographic low where the lavas then erupt again onto the surface in the form of dark breakouts. Higher resolution data also revealed a third hotspot between the two, from an area of activity in the center of the lava flow. The dark ring around Prometheus in the 4.2 micron data, in the middle of an SO2 absorption band, results from plume fallout, not only of the present day plume, but also from the previous eastern location of the plume, as seen by Voyager in 1979. 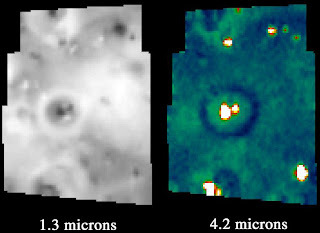 NIMS also used its first opportunity to image Io at high resolution to search for small and faint hotspots and observations like the one above and below revealed several of these thermal features, including the first hotspots observed at volcanoes like Tien Mu Patera and Steropes Patera. I know I haven't covered results from Photopolarimeter-Radiometer (PPR), Galileo's mid-infrared mapper, but it is getting rather late and I want to get this post out the door. PPR further provided coorelations between thermal emission and dark materials. 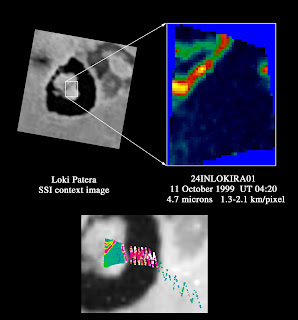 During I24, PPR observed Loki near the start of a new overturning event at the lava lake there, as evidenced by increased thermal emission near the southwestern end of the patera, where these events typically start before moving around the patera in a counter-clockwise motion. PPR also observed older flows at Zamama and Pillan, providing estimates for the age of these flows. I hope you have all enjoyed this look back at Galileo's I24 flyby, which occurred 10 years ago on October 11, 1999. Galileo would go on to encounter Io five more time as it wound down its mission at Jupiter, helping to revolutionize our knowledge of this exciting satellite. Elsewhere, Bad Astronomy has a great link to a new National Geographic map that provides a visualization of the first 50 years of interplanetary space exploration. The Galilean satellites session at this year's DPS meeting was held today in Fajardo, Puerto Rico. I am not at the meeting, but you can check out my thoughts on the Io-related abstracts for this meeting that I posted a few weeks ago. While I haven't heard word on what was presented at the Io talks, there is a new press release today covering one of the Europa talks, "Vertical Transport through Europa’s Crust: Implications for Oxidant Delivery and Habitability," by Richard Greenberg. At this talk, Greenberg presented results on the production of oxygen through radiolysis and photolysis of water. During these processes, some water molecules on Europa surface are broken down into their oxygen and hydrogen components by high-energy particles in Jupiter's magnetosphere and photons from the Sun. Greenberg combined this research with estimates of Europa's resurfacing rate to determine how much oxygen is delivered to the satellite's sub-surface ocean. 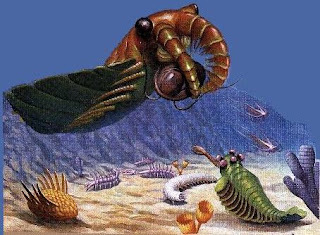 He found that given this resurfacing rate, the concentration of oxygen in Europa's ocean would exceed those of the Earth, making possible not only microbial like, but the kinds of multi-cellular aquatic like we are more familiar with. Greenberg also notes that an initial, 2-billion year delay in this process would prevent the premature oxidation of organic compounds that would have prevented the development of life. So for those who dream of eating Europa calamari, you just got a big boost today. Now we just need to find organic compounds at Europa... otherwise, all you have is a quite oxygenated, but sterile, ocean. 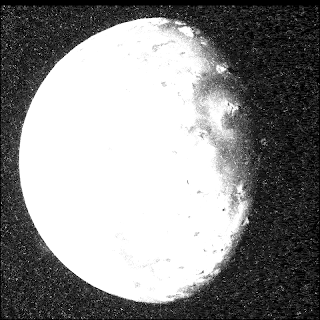 With NASA looking toward tomorrow morning's LCROSS impact of the Moon, we will begin our look back at Galileo's October 11, 1999 encounter with Io, which occurred 10 years ago Saturday night/Sunday morning. While this flyby didn't involve the kind of exciting impact that the LCROSS event will, this flyby provided scientists their first opportunity to image Io up close. Today we will look back at the planning that went into that flyby along with some of the data that influenced image targeting choices. Over the next few days, we will take a look at the images and other data acquired and the problems encountered during that flyby. 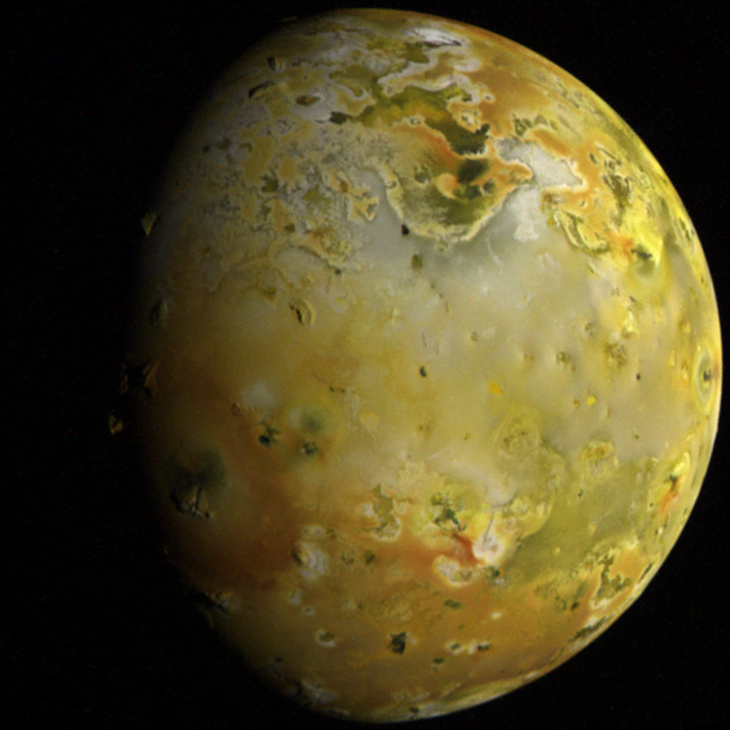 The October 1999 flyby was not Galileo's first encounter with Io. Shortly before entering orbit around Jupiter on December 7, 1995, Galileo flew within 897 kilometers (557 miles). As originally planned, this encounter was to be the spacecraft's only flyby of Io as the intense radiation of the Io plasma torus was considered a major hazard for Galileo. You can watch a video of a simulation of this encounter that I uploaded to Youtube back in March. Unfortunately, in October 1995, a problem occurred in Galileo's tape recorder, which was to be used to store data recorded by the spacecraft's various instruments (and the Galileo Probe during its descent into Jupiter during the JOI event). The tape recorder became stuck after saving a color image of the Galileo probe entry site. While a workaround for this issue had been found by avoiding the area of the recorder with the Jupiter images, the additional decision to only use the recorder at low-speeds during the Io flyby, orbit insertion, and the Galileo probe atmospheric entry precluded the use of remote-sensing instruments during the Io encounter. The loss of Io imaging during I0 left researchers with a desire to return to Io, but Galileo wouldn't come much closer to Jupiter than Europa's orbit during the rest of the primary mission, which ended in December 1997. While Galileo certainly wasn't without its problems, at the end of the primary mission, the spacecraft was deemed healthy enough for a two year-extended mission to be funded. The extended mission, also known as the Galileo Europa Mission, would focus on Europa to follow-up on the amazing discoveries from the primary mission. After eight flybys of Europa between December 1997 and February 1999, Galileo would then flyby Callisto four times in mid-1999 to lower the spacecraft's orbital perijove down to the orbit of Io. 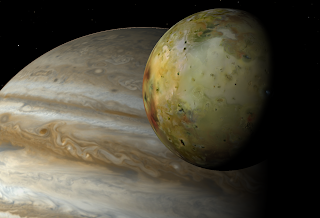 These Callisto encounters would help setup two encounters with Io in October and November 1999 (assuming the spacecraft was alive after the first flyby). Galileo used Callisto encounters between May and September 1999 as gravity assists to sling shot to spacecraft into orbits that brought it closer to Jupiter, into the Io Plasma Torus and within the orbit of Io. 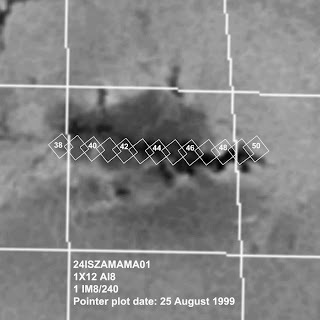 Such gravity assist maneuvers also allowed to spacecraft to approach closer to Io, not only during the two encounters in late 1999, but also during a non-targeted flyby on July 2, 1999. 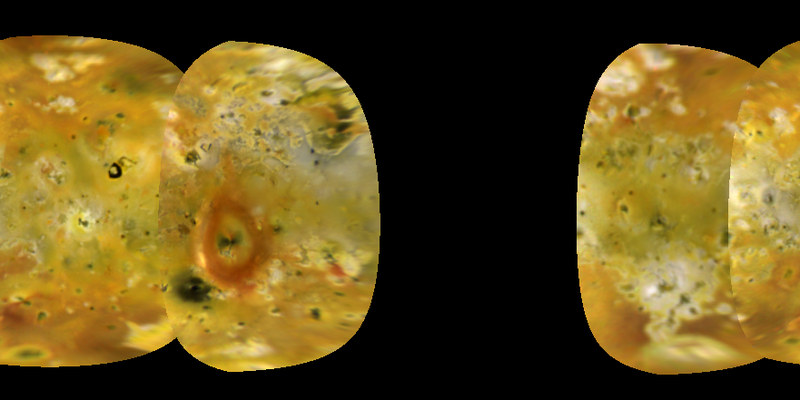 This encounter, at a distance of 127,000 kilometers (79,000 miles), provided an opportunity to image Io's anti-Jovian hemisphere at 1.3 kilometers (0.8 miles) per pixel. The resulting mosaic is shown at left. This hemisphere covers much of the same territory that would be seen by Galileo in sunlight during I24 and I25, allowing researchers to better plan remote-sensing observations during the Io flybys. 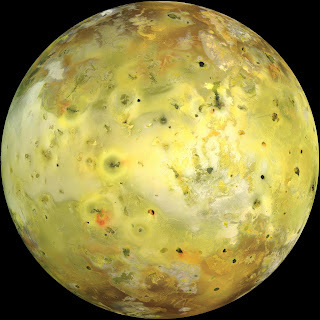 During the next two orbits (C21 and C22), Galileo also observed Io from a greater distance, searching for surface changes and active volcanic plumes. Again, like the global mosaic, these distant observations were designed to help Galileo scientists improve their science plan for the two flybys by potentially taking advantage of any major eruptions that might have been going on that summer. 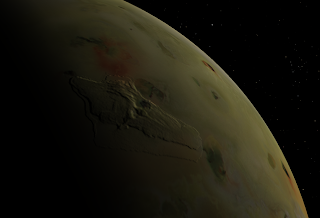 In the C21, a large, red ring was observed around the volcano Grian on Io's sub-Jupiter hemisphere, the result of an outburst eruption that started on June 22, 1999. The faint plume deposit had faded by the next perijove passage in mid-August. A similar new plume deposit was also found at Masubi. Unfortunately, like Grian, Masubi would be in the hemisphere opposite of what would be observed by Galileo up-close. The plume search imaging revealed volcanic plumes at Prometheus, Amirani, Masubi, and Grian. With the data from the prior extended mission orbits in hand, planning for the I24 encounter could begin in earnest. 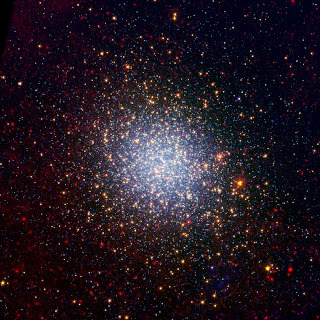 An ambitious imaging plan developed with sixteen mosaic observations consisting of 191 images total. 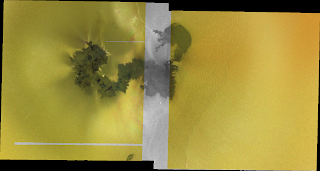 In order to play all these images back in the month and a half between I24 and I25, nearly all of the images were acquired in summation mode (AI8), which shrank the images to 400x400 pixels in size, as opposed to 800x800 pixels for full-frame Galileo SSI images (IM4/IM8). The use of this mode would allow scientists to sacrifice spatial resolution for additional imaging and expanded coverage. Active volcanic centers. This included high-resolution imaging of the Prometheus, Zamama, and regional-scale imaging across the Amirani, Marduk, and Isum flow fields. Galileo's highest resolution imaging were to cover the Pillan flow field, emplaced during a major outburst eruption in 1997. Finally, Galileo SSI would image the Pele lava lake at high resolution while Pele was still on Io's nightside. Mountains. 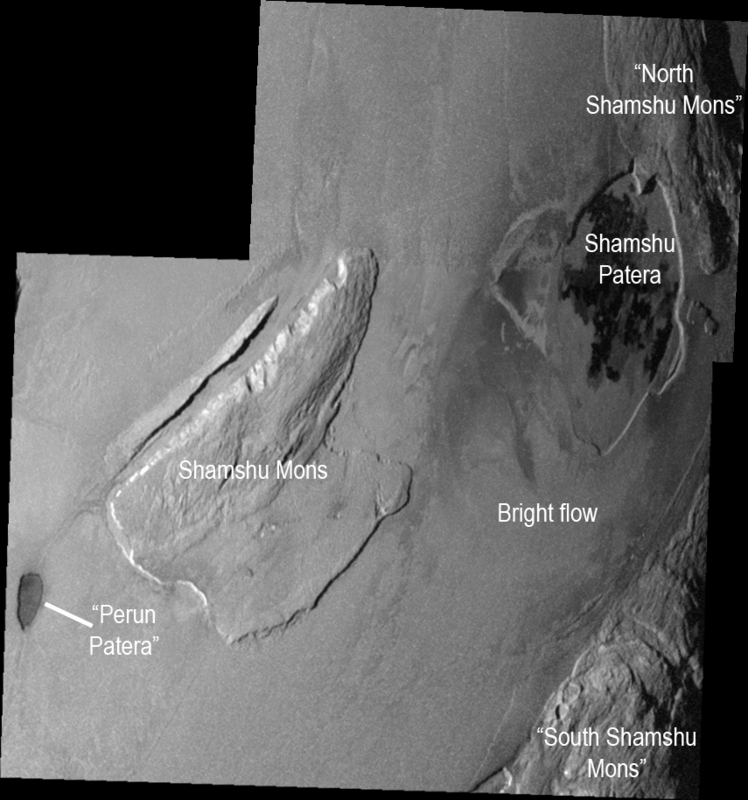 This included high-resolution imaging across Ot Mons in central Colchis Regio and regional imaging of Tohil Mons, Dorian Montes, Monan Mons, Hi'iaka Montes, and Gish Bar Mons. Paterae. 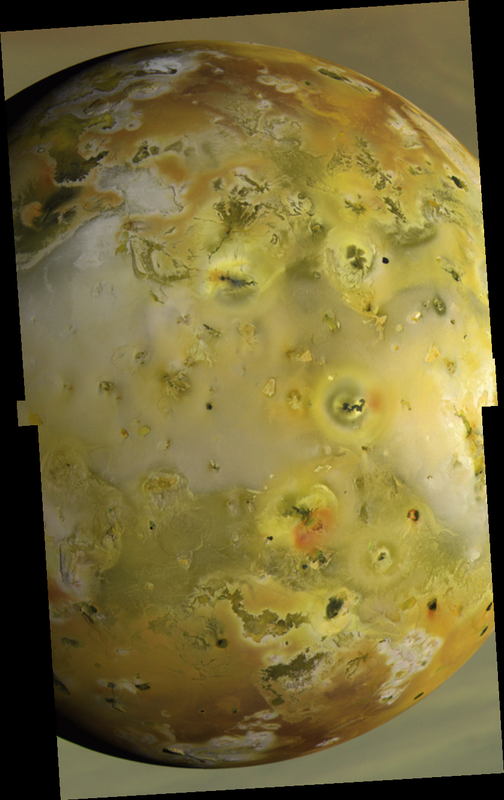 Like imaging of Io's mountains, observations of Ionian paterae (essentially volcanic depressions) were focused along the terminator. This primarily consisted of regional scale imaging near the Amirani flow field and included Monan Patera and Gish Bar Patera. Context imaging. Unlike Cassini, Galileo had no wide-angle camera. 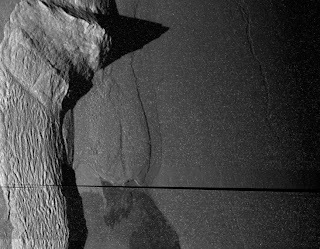 In order to provide context for its higher resolution imaging (such as over Pillan and Ot Mons), Galileo would image several of these areas again at lower resolution to better understand how the geologic structures observed up-close fit in to their surroundings and to provide a bridge in resolution between the high resolution imaging and the global views acquired earlier in the mission. Stereo imaging. Several of the observations planned for the I24 flyby were designed to act as one part of a stereo observation that would be combined with a companion mosaic to be acquired during another encounter. This included a global mosaic at 1.45 kilometers (0.9 miles) per pixel covering the anti-Jupiter hemisphere (to be combined with the global mosaic from C21) and a six-frame mosaic covering Tohil Mons (to be combined with a similar mosaic during the February 2000 I27 flyby). In addition to the imaging, the other instruments onboard Galileo planned for a very busy encounter. the Near-Infrared Mapping Spectrometer (NIMS) team planned to look at several of Io's active volcanic centers, like Prometheus and Amirani, in sunlight in order to not only derive lava temperatures, but to also determine their composition by acquiring spectra across the volcanic flow fields. 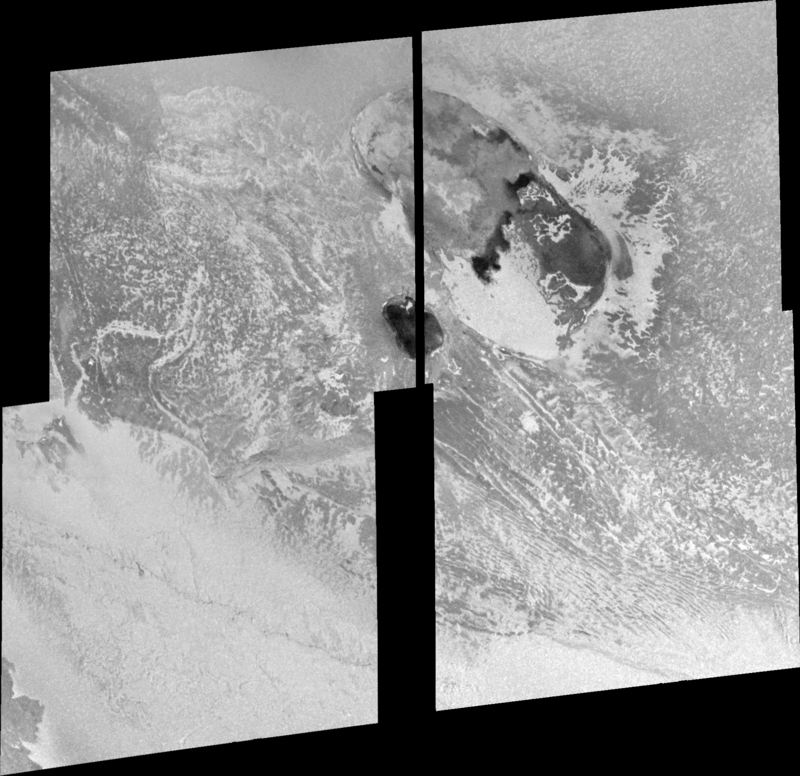 NIMS also would image several volcanoes on Io's nightside, including Loki and Pele, focusing primarily on the distribution of hot material at these volcanoes. Finally, NIMS would ride along with SSI observations as well as acquire global observations in order to determine the distribution of small volcanic centers on Io's anti-Jupiter hemisphere. The Photopolarimeter-Radiometer team planned their mid-infrared observations along similar lines, mapping thermal emission over the night-side, sub-Jupiter hemisphere and the day-side, anti-Jupiter hemisphere. With planning completed and the sequences uploaded to Galileo, scientists could only wait and see if their observations were successful. In the next part of our series looking back at the I24 flyby, to be posted Sunday, we will take a look at the encounter itself and the issues that cropped up during the flyby. Later next week, we will then take a look at the data that came back following the flyby. Normally, I try to stick to Io and the Jupiter system on this blog, but occasionally I do pay attention to what else is going on in the unmanned spaceflight community beyond Cassini/the Saturn system and the Jupiter system. 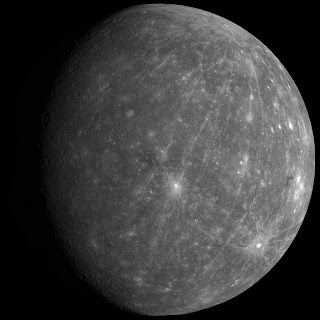 Last week, the MESSENGER spacecraft performed its last of three flybys of the planet Mercury before it will go into orbit around the planet in 2011. In response to this flyby, I finally decided to piece together one of the global mosaics from last year's encounter, which covered similar territory. This mosaic, consisting of 66 MDIS, narrow-angle camera images, was produced using a combination of ISIS3 (to calibrate and reproject each frame) and Photoshop (used to actually piece together each image). This mosaic could have been produced, I guess, entirely in ISIS3, but I found that trying to create a coherent control network that takes into account issues of camera twist angle and readily apparent range-to-target smear was a next to impossible task (I would like to apologize now to anyone trying to use Tethys in PIRL over the last few days while I was trying to create said control point network). The end result is the image you see at left. Click Here to download the full resolution version of this mosaic. It would probably be best to just right-click and save the link as the full resolution version is a 20 MB PNG image file. Click the image above for a lower resolution version. This mosaic is in orthographic map projection with a resolution of 0.6 kilometers (0.37 miles) per pixel. It is centered around 2 degrees South latitude, 322 degrees East longitude. 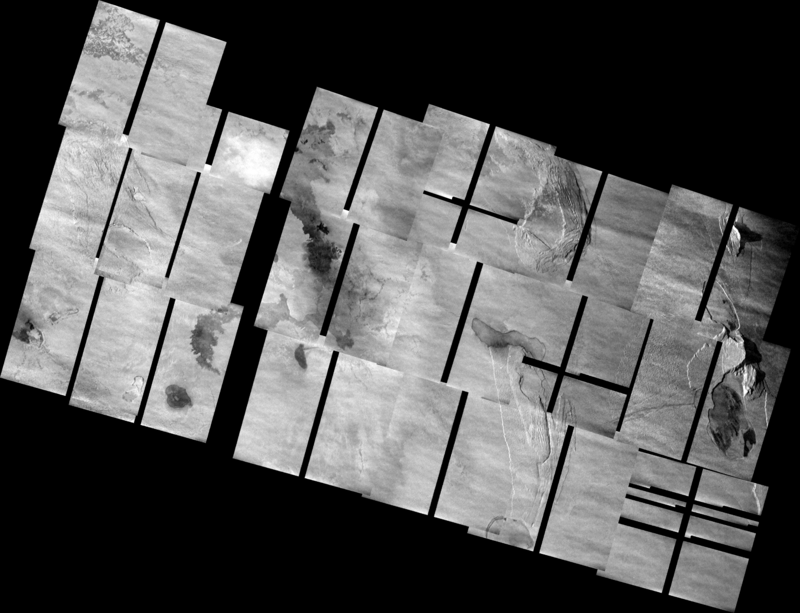 The mosaic covers the eastern portions of the terrain covered by Mariner 10 in the 1970s as well as some terrain that wasn't revealed until the MESSENGER encounter on October 6, 2008. This terrain includes two ray craters at upper right and lower right that had previously only been seen in low-resolution RADAR data from Earth. 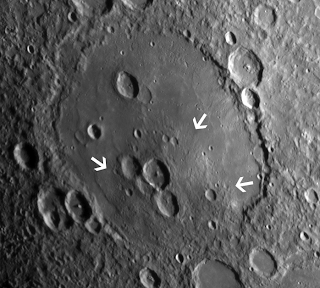 The prominent ray crater just below and left of the center of the mosaic is Kuiper, previously observed by Mariner 10. Some of the images from last week's encounter are slowly making their way to the MESSENGER home page, though versions that can be input into ISIS3 and converted into these huge mosaics won't hit the NASA PDS until sometime next year. I hope you all enjoy this little treat. After I get some sleep, I will post more on some of the cool features you can find while searching around this mosaic. 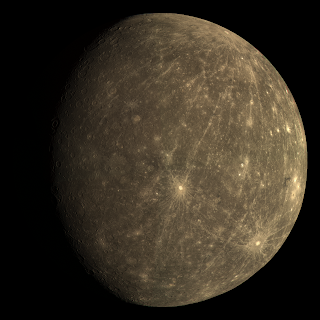 To be honest, my new favorite crater (at least on Mercury) has to be Rafael. In the morning, I will talk about why.